The last time around, I'd mentioned a few of my May weather related turn arounds. This day was also attempted in May, just a few days after the large snow storm we'd received. My thinking was that the Longs area tends to either melt out or have the snow blown away relatively quickly, so maybe it would be dried out somewhat. The going was good until I hit tree line and the mashed in trail ended. From there on up, it was post hole mania, the snow having drifted up to waist deep in places. I'd planned to take the trail around Mount Lady Washington and then hit Chasm View, but as that didn't seem to be an option, I went directly up the east ridge of MLW. I probably made it to around 12200 feet when I hit my hard turn around time. So I turned back, but promised to return once the snow had melted out. This was my first time up the Longs trail in a season other than winter. It was weird to actually hike on dirt and rock for a little while. Snow was hit before too long, which became solid snow up until tree line. I didn't use traction devices at all, and made the first outing of the year in trail runners. Above tree line and in the full eye of the sun, the weather warmed significantly. I stopped to take off a layer, and was accosted by this little guy. S/he got about six inches away from me. Obviously people are feeding the animals. Looking east to Battle Mountain. I stopped for a snack break at Granite Pass, and thought about the last time I was here. It was zero degrees with a pretty stiff wind. Very cold. On this day it was quite pleasant. Up to the Boulderfield. I thought I'd add on Mount Lady Washington after ascending to Chasm View, but it looked so close I decided to just go for it from here. The views of Longs grew better and better of course. The summit of Mount Lady Washington is unremarkable, though it does offer some great views, and can be a somewhat fun scramble on the way up. The diamond grew ever more impressive and imposing. Since it looked like snow might still be a factor and I didn't bring crampons or an ice axe, I had to stay right next to the ridge between MLW and Longs to stay mostly on rock. The drop off to the east isn't always as precipitous as you'd think, and this did offer some fun scrambling/route finding. Down one of the couloirs to Chasm Lake. I saw this person on the north face. There was a little bit of snow to contend with before reaching Chasm View. It was still frozen pretty hard and without proper tools, I really had to take my time moving up and across it. But I made it to the little window that is Chasm View, and what a great vantage point. I have another photo of the opposite view shot from Chasm Lake that will come later. The steepness of the diamond. Pretty cool to be this close up to it. Mount Lady Washington on the descent. I was able to glissade/ rock hop back down to the boulder field and start on my way back down. Saw this runner hit the keyhole and turn back. I made my way around MLW and got back to Chasm Junction in short time. From here, I headed to Chasm Lake. The snow along the trail has mostly melted out with one exception- the very long stretch over Columbine Falls. However, the route is pretty well beat in and I felt fine crossing it in trail runners. What a view at Chasm Lake! If you follow the ridge that heads right from Longs here, you'll see it dip before rising slightly and dipping again. That dip is Chasm View. This photo shows Mount Meeker, The Loft, Ships Prow, Se Longs(aka The Beaver), and Longs true summit. By now I was feeling a bit tired, but if I didn't go down to Peacock Pool, I'd just have to come back for it. In reality, I think it only took me ten minutes or so down and slightly more back up. I would stay in the rock before you hit Columbine Falls, but then make your way over to end up following the drainage from the falls down. This seemed to keep the terrain pretty reasonable and avoid any bushwhacking. Looking east from the lake it looks like the world just ends. I was very tempted to jump in. The water was frigid. But the sun, my constant companion of the day, now turned intermittent. But soon enough I will be swimming in a lake. Back on the trail I could see down to the plains below. I noticed I could see Coffintop from up here. And a last parting view up into Chasm Meadows, a spectacular place to be. 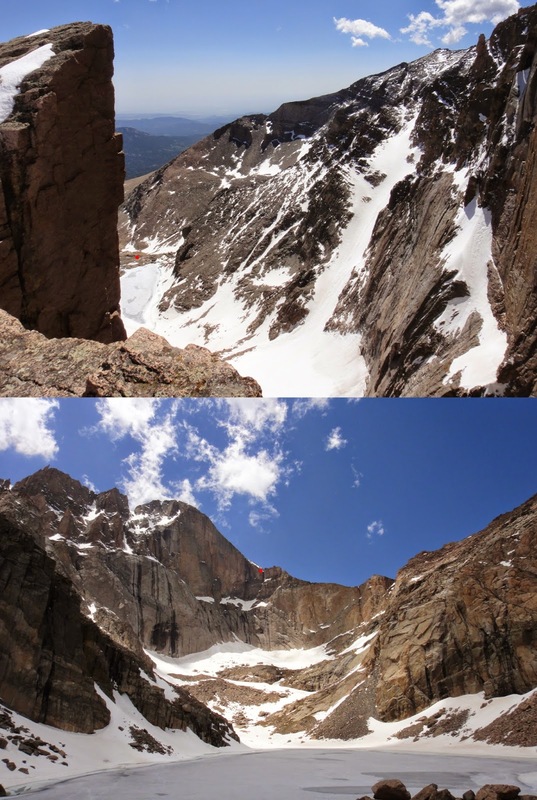 The Longs Peak cirque is certainly one of the most spectacular places in the park and one of the most traveled, particularly once non technical conditions come around on Longs. And if you take the time to get to Chasm View, the scope of the scene at your feet is amazing and awe inspiring. It offers a very unique perspective on Longs itself. Chasm Lake is a must visit in my opinion. With the altitude and exposure, it will be important to start early. While you are there, I'd recommend to make the second class scramble down to Peacock Pool. While I can't comment on the amount of middle of the summer visitation it gets, my general experience in RMNP leads me to say that if there isn't a trail directly to something, it won't be visited that much even if a popular trail goes right by it. Take the time to get there and enjoy a peaceful lunch break, take in the views, listen to the waterfall. Take the time to enjoy this wonderful and magical place. 6.3 miles one way, 3881 foot gain. Second class. Strenuous-. 6.3 miles one way, 4100 foot gain. Second class. Strenuous-. 4 miles one way, 2199 foot gain. Moderate+. 4.2 miles one way, 2380 foot gain. Moderate+. 3.9 miles one way, 2040 foot gain. Moderate+. 3.9 miles one way, 1900 foot gain. Moderate+. By my estimate, this hike covered 14 miles with 5000 feet of gross elevation gain. Strenuous.